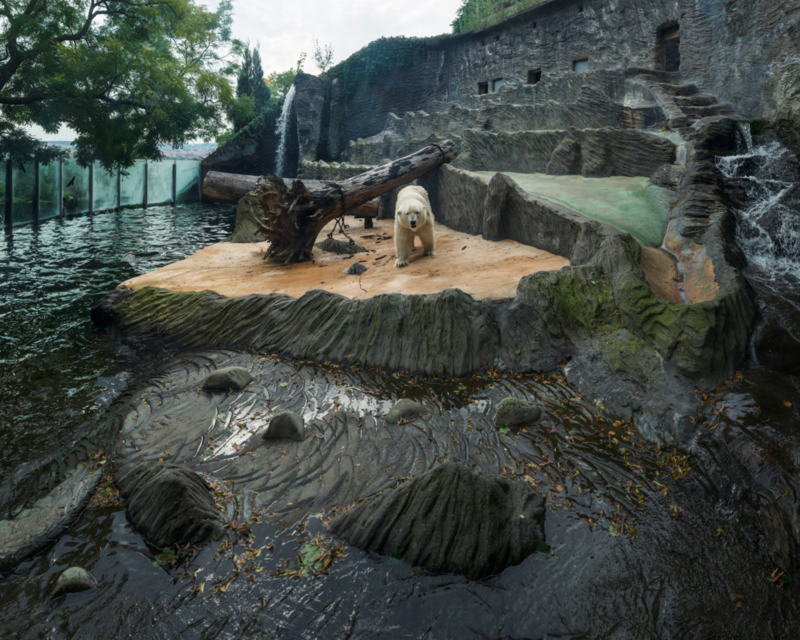 “This series is not about polar bears” says Taiwanese photographer Sheng Wen Lo—which might come as a surprise given the title ‘White Bear’, and the appearance of polar bears as the protagonist in every image. 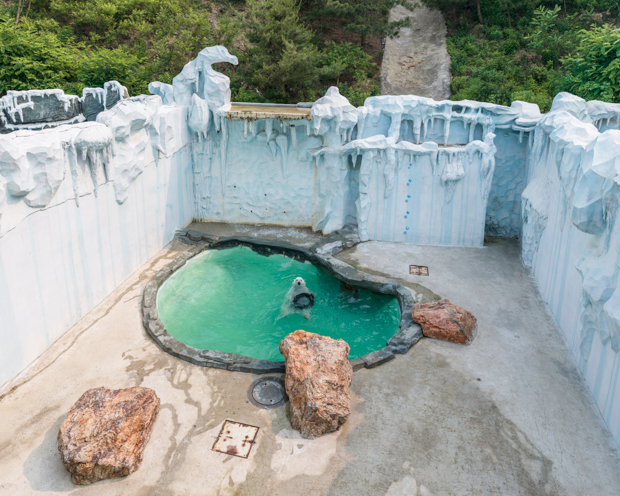 The artist’s intention was instead to reflect on the controversy of keeping captive wild animals on display, the discrepancy between our intention as zoo-goers and the overall cost to the animals’ wellbeing. This theme is confronted with focus on one particular species which he believes stands at the crux of this issue. Polars bears are native to a region that lies for the most part within the Arctic Circle, and their bodies are well-adapted to these extremely cold conditions. Though born on land, in the wild they spend most of their life on sea ice, hunting for the seals; the sea is their main source of food. Natural endurance swimmers, when in their unrestricted, natural territory, polar bears have been known to swim up to 60 miles without pause. 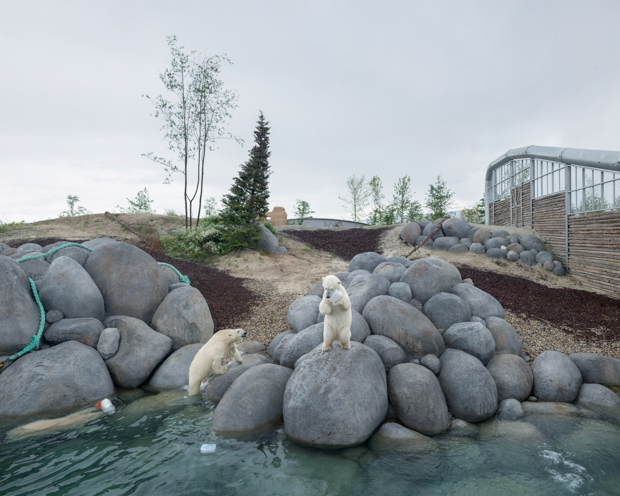 The photographer shot White Bear in 16 locations in Europe and 10 locations in China; the project took him to zoos, aquariums, wildlife safaris and a shopping mall. At the risk of being accosted for anthropomorphising, the animals don’t look altogether happy in their small, often inadequate enclosures, though this is not what the artist wants to portray. 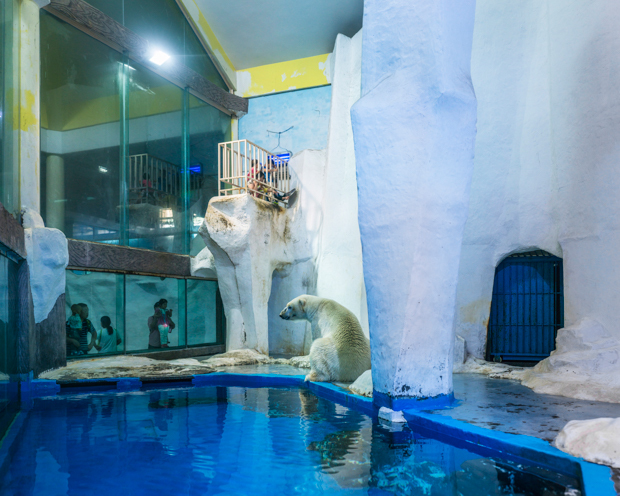 He endeavoured to look closer at the underlying issues of keeping animals that are perhaps more ill-suited than others to captivity. Sheng elaborates: “I am curious about human-animal relationships, and examine them more scientifically”. 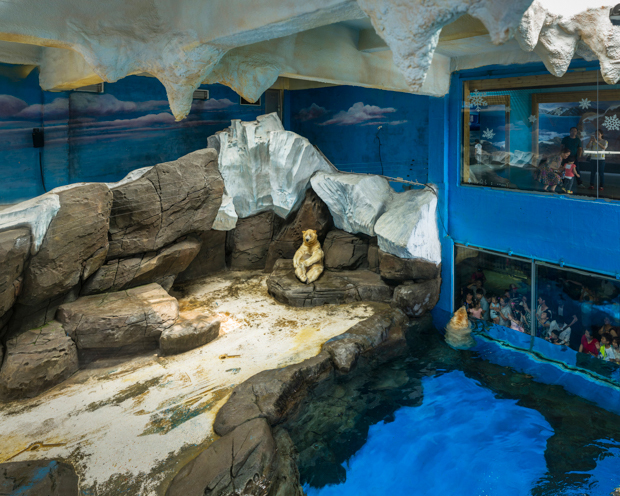 Many animals are born in these enclosures and have never encountered their staple food, the sea lion. These are a far cry from their natural habitats, what with the plastic icebergs and other props that allude to their home in the wilderness. “I wonder who are the users of these visual objects, and whether the enclosures are homes or stages?” poses the photographer. Each shooting session lasted more than six hours; Sheng ate alongside the bears, often consuming the same food as them, apples and bread for weeks on end. He envied his subjects when they ate more than he did, though felt stressed watching them pace for hours. 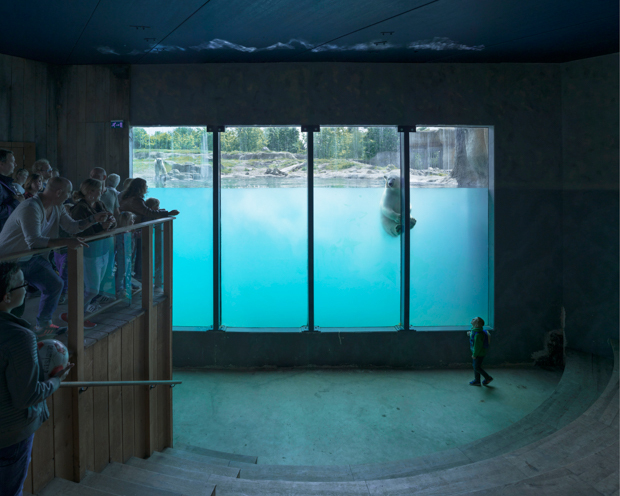 The photographs in White Bear tend to focus on the negative issues concerning keeping animals in captivity. In the future Sheng would like to produce a series that also considers the potential advantages of animal captivity, for example, the provision of shelter to native, injured animals and to those rescued from poor animal husbandry conditions. 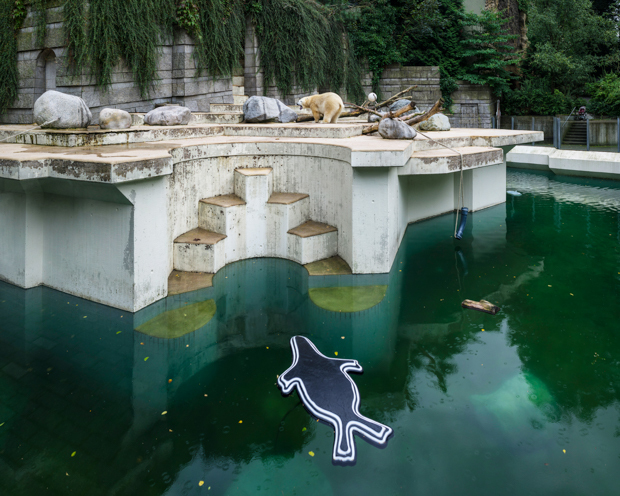 With White Bear, the intention is to encourage people to reflect on how our own desires directly and indirectly influence the fate of some animals. “it seems natural that we like to watch or connect with exotic or cute animals in live action, but satisfying this desire comes at a cost”. Sheng is currently in the process of making this into a kid-friendly photo book, which he hopes will leave young readers with questions that stay with them forever. Catch White Bear at FORMAT festival which is being held at the Déda Gallery in Derby, from March 23rd-May 8th 2017.